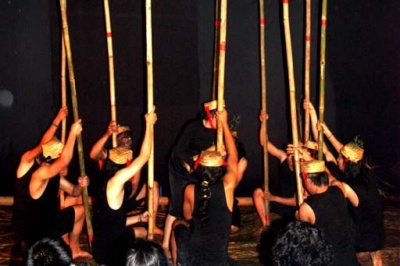 A community-based theater from Bandung will present their play Tanah (Land), which delves into the issue of land at Taman Ismail Marzuki (TIM) cultural space this Friday night. The theater community Celah-celah Langit or the Ledeng Cultural Centre, headed by performer Iman Soleh, based in Ledeng, Bandung has been preparing the production of this one hour and 10 minutes show since November 2010. The play will be open to the public and take place in Sanggar Baru, TIM. Celah-celah Langit opened their première of Tanah in Bandung. After Jakarta, the theater will also perform in Jatiwangi. The play is part of a theater for development and educational project supported by Kelola Foundation, a not-for profit organization for the arts and culture and Theater Embassy from the Netherlands. The 13 scenes of the play are based on 25 texts produced by the people of Bandung hilly area in Lembang who have been affected by Lembang’s changing landscape. Iman said the idea for this play had germinated in Lembang in 2009. With the Netherlands Theatre Embassy and Kelola Foundation, Iman held writing workshops in Lembang to find out the experiences the Lembang people had with the changing of the land. “The writings were diverse, with diverse language as well. We held continuous discussions around the writings that were collected,” Iman said. “The discussion process was longer than other explorations [for the play],” Iman said. He added that the story of Lembang was only an apercu, which fit into the bigger problem of land in general. The play is being presented in Jakarta, Iman said, because the capital also has its own unique land problems. “There are 1,007 land cases in Jakarta and 125 of them are unresolved,” he said. Iman pointed out that 26 people were involved in the production including musicians, costume designers and lighting crew. There are 15 actors in the play. Bamboo and hay will be prominent theater props to convey a feel of the agrarian life. “We brought 20 long bamboo poles from Bandung,” he said. Egbert Wits, the coordinator for theater for development and education from Theater Embassy, said the production aimed to “give voice to the people through art”. The people can benefit from the production process with new skills such as writing, poetry reading, singing and dancing. “The people become more confident and become brave in speaking in public,” he said. Wits added that the theater for development aimed to stimulate a dialogue between people about the issues that was being put forth in the play.